A new Pew Research Center survey finds that harassment is a common feature of online life for many adults. Most Americans say that such harassment is a major problem, and many look to a host of institutions – such as online companies and law enforcement – to curtail online abuse. 1 Around four-in-ten U.S. adults (41%) have experienced some form of online harassment, and an even larger share – 66% – have seen this happen to others. Pew Research Center measured online harassment by asking respondents if they had personally experienced at least one of six types of behavior online: Offensive name-calling, purposeful embarrassment, physical threats, harassment over a sustained period of time, sexual harassment or stalking. 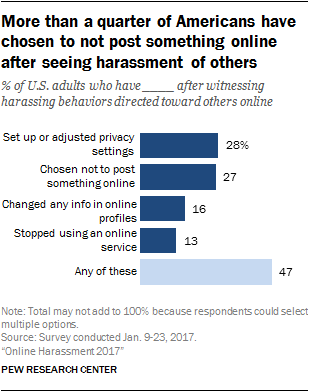 Overall, 41% of U.S. adults say they have been the target of at least one of these harassing behaviors online, representing a modest increase from 2014, when 35% of Americans said they had been harassed online. And while 22% of Americans say they have experienced only less severe forms of online harassment, such as name-calling or embarrassment, 18% have been the target of more severe forms of online harassment, including physical threats, sustained harassment, stalking and sexual harassment. Witnessing online harassment is an even more common aspect of digital life: Two-thirds of Americans say they have witnessed others being harassed online, according to the new survey. 2Experiences with online harassment tend to vary across demographic groups, with young adults the most likely to face online abuse. About two-thirds of 18- to 29-year-olds (67%) have experienced some form of online harassment, compared with a third of those ages 30 and older. And adults ages 18 to 29 are more than three times as likely as those 30 and older to be the target of more severe forms of online harassment (41% vs. 12%). 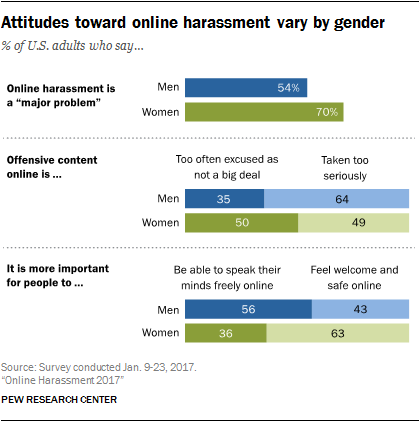 Men are somewhat more likely than women to be harassed online (44% vs. 37%), but women – particularly younger women – are more likely to be the targets of sexual harassment online. Two-in-ten women ages 18 to 29 (21%) say they have been sexually harassed online, and 53% have been sent explicit images that they didn’t ask for. 3 Political views, physical appearance, gender and race are among the top reasons people say they are harassed online. Some 14% of Americans – representing 35% of those who have encountered any type of harassment online – say they have been the target of online harassment because of their political views. Democrats and Republicans are equally likely to say this. Among other reasons people have been harassed online, around one-in-ten U.S. adults cite their physical appearance (9%), while 8% each say they were targeted because of their gender or their race or ethnicity. Smaller shares cited religion, sexual orientation, occupation or disability status as reasons. 4Social media is by far the most common venue for online harassment. When asked where their most recent incident with online harassment occurred, 58% of those who have been harassed online cited social media, the most common response. By comparison, 23% of online harassment targets say their most recent experience occurred in the comments sections of a website, while 15% cited a text or messaging app. 5Americans are divided on the balance between free speech and making others feel welcome online. When asked which they feel is more important, 45% of Americans say it is more important that people are able to speak their minds freely online, versus 53% who say it is more important that people are able to feel welcome and safe online. Americans’ views about the balance between online safe spaces and free speech tend to vary by gender. Men are more likely than women to say that it is more important for people to be able to speak their minds freely online (56% vs. 36%), while women are more inclined than men to say it is more important for people to feel welcome and safe in online spaces (63% vs. 43%). And while women are mostly divided on whether or not offensive content online is “too often excused as not a big deal” or if it is “taken too seriously,” 64% of men say offensive content on the web is taken too seriously. 6A majority of Americans view online harassment as a major problem, and many look to online companies to address this type of abuse. Roughly six-in-ten Americans (62%) say online harassment is a “major problem,” while a similar share (64%) say that online platforms should play a “major role” in addressing it. Furthermore, roughly eight-in-ten Americans (79%) say online services have a duty to step in when harassment occurs on their platforms; just 15% say that these services should not be held responsible for the behavior and content of its users. 7 Overall, 43% of U.S. adults say that law enforcement does not take incidents of online harassment seriously enough. Another 19% feel that police do take harassment complaints seriously, and 32% are unsure of how law enforcement handles this issue. There are also clear differences based on one’s own personal experience with online harassment. Almost half (49%) of those who have experienced some type of harassing behavior – including 55% of those who have experienced severe types of harassment – feel that law enforcement does not take online harassment incidents seriously enough. This figure drops to 37% among those who have not experienced any type of online harassment themselves. 8A large majority of the public says anonymity is a key factor in online harassment. Nearly nine-in-ten Americans (89%) say the ability to post anonymously enables people to be cruel or harass one another. Among those who have been harassed online, 54% say their most recent incident involved a stranger or someone whose real identity they didn’t know. And the vast majority of Americans (86%) agree the internet makes it easier for people to remain anonymous. 9 Witnessing online harassment has led some bystanders to change their online behavior. Roughly one-quarter of Americans (27%) say they have chosen not to post something after witnessing online harassment, while a similar share (28%) say they adjusted their privacy settings after seeing this type of online behavior. Some users report going a step further: 13% of U.S. adults have stopped using an online service altogether after seeing others being harassed. For more: Read a Q&A about how and why we conducted the survey with its author, Maeve Duggan.